The Mount Dracula👿 is a Boss-monster that reviewed himself on 31st October 2015 Halloween while heroes start digging into the underworld. Mount Dracula will transform into 2 different type based on the heroes and heroines personality and figure. When meeting with evil and ugly heroes, Mount Dracula will become as huge as a Mountain,to show its dominant power and status and fight to defend its home territory. When the heroes and heroines are good personality, cute and pretty, Mount dracula would love to become a mount for the heroes to show his love. Especially those who are below 1.5 meters height and looks like a kid, Mount dracula would become very lovely and gentle as he is a lolicon, who loves kids a lot. Mount dracula that gets mounted! 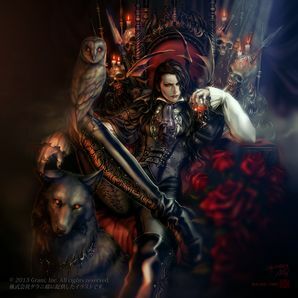 Mount dracula is a feminine and very gentleman towards ladies. He hunts down ladies that are out at the midnight and treat them with love and care, eventually sucking their blood and makes them aroused to extreme delighted. He do not kill them, but in fact he makes them asleep for ages and centuries, and framing them into beautiful display box to be admired everyday. When he saw a male hero, he felt disgusted and would violently slaughter them. Putting their corpse into a pumpkin🎃 and plating it with gold to make them look nicer. Mount Dracula's castle is deep in another world that is almost impossible to reach for normal beings. But on the day of halo ween, Godville is mounted with the underworld and the castle is opened for kids to collect candies with 'tricks or treats' as the Mount dracula loves kids a lot. However some foolish heroes and heroines are yet too confident with their embarrassing look and personality disturb on the Dracula's lair. They will be given a nice and awful 'trick or treats'. Extremely experienced and skillful casanova that literally most of the female would fall in love. Hates sunlight that will make him get sun burn.